This May, the Smithsonian's S. Dillon Ripley Center opened up "The Patents and Trademarks of Steve Jobs: Art and Technology that Changed the World." The traveling exhibit, which features the many, many patents of Steve Jobs, was designed by the National Inventors Hall of Fame and Museum and is fairly breathtaking for being 312 pieces of paper. Consisting of 30 display panels that are each four feet wide, eight tall and shaped like the face of an iPhone, the exhibit displays facsimiles of 312 of the 317 different patents that Steve Jobs acquired. It also has a case with an a 1984 Apple Macintosh Computer; a 1992 NeXT monitor, sound box, microcomputer, keyboard and mouse; and a 2003 Apple iPod, which was the first to feature a discrete touch-sensitive click wheel as opposed to one with distinct mechanical buttons. We chatted with Richard Maulsby, Associate Commissioner for Innovation Development at the U.S. Patent and Trade Office, who told us: "I think what we endeavored to do with the exhibit is capture not just the quality but the breadth of this man's innovation genius." The exhibit is displayed in chronological order, allowing users to trace the development of some of the most innovative and influential technology existing today through patents. "You can track through the patents how something like the iPhone developed over a period of time," Maulsby said. One of the most interesting parts of the exhibit is seeing how products such as the iPod had its design patented before it had an actual working model. Jobs knew how to sell his products, that's for sure, but the idea of creating a design before a function seems backward, like the proverbial cart before the horse. But then, I suppose that's why Steve Jobs made a fortune as one of the most innovative individuals on Earth, and people such as myself are paid to write about him. Since the patents are both for utility and design, many of his more popular creations were visualized long before they existed tangibly. At this point, Jobs has 317 patents with his name as one of the creators (if not the sole creator), but that number could expand as the patent process takes time and others will carry out work he's begun. These patents range from the intricate technology of the iPhone to the branding of that small colorful apple logo that the company used from the 1970s to the late '90s. One of the most surprising patents in the exhibit is the iconic clear staircase that adorns Apple stores. Most probably don't realize this is even a possibility, but, as Maulsby reminded us, "both the Statue of Liberty and the Twin Towers are examples of design patents." In fact, the patent system allows for designs that would surprise most people, according to Maulsby, in that they can be as radical on paper as they are fully realized. By patenting both the utility and design, Jobs controlled the marketing of these products, placing him among the names of an extremely small number of American inventors. "I doubt that many have the patents that cover utility and design," Maulsby said, as usually inventors only lock down one or the other. He compared Jobs to Walt Disney and Thomas Edison, two other people who built their empires not just on innovation but on design. Jobs did this by creating a brand so impermeable that anyone who tries to mimic finds himself in an unkind world. Just take a look at the comments on this story about an HP keyboard that looks like a MacBook's. The sleek black and white case design was no accident: as mentioned earlier, Jobs and the designers at Apple knew how they wanted the cases to look before they even knew what they ultimately wanted in them. Edison, by the way, was a patent record setter with more than 1,000. But Maulsby said the number of patents is a fairly meaningless thing. What Jobs did so impressively was have a number of useable patents that created useful innovation. Take David Weder, an Illinois man who holds 1,321 patents. Most of these involve floral arrangements, such as "Method of covering a flower pot" and "Method of covering a flower pot or floral grouping." Obviously, there's nothing wrong with this: it helps his business and presumably leads to more interesting floral arrangements, but it doesn't have quite the same impact of Jobs' 317 patents that have helped revolutionize our world of technology. (See: the iPod and, though I'm not quite on board with it yet, the iPad). 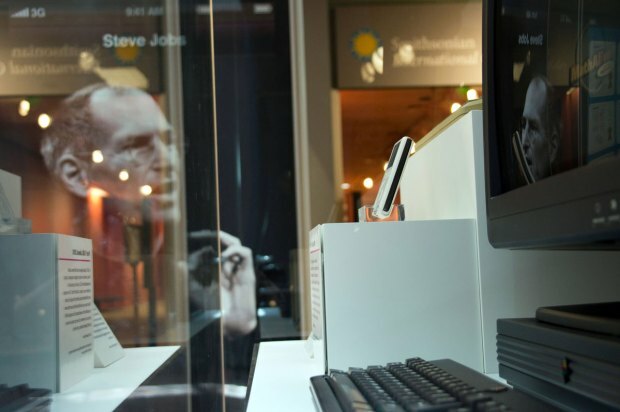 The most surprising part of the exhibit for Maulsby "was the totality of [Steve Jobs's] role in the creation of the intellectual property that made Apple what it is today." Not many CEOs spend their time actually inventing and patenting the products that their companies sell, but Jobs was not most CEOs. In fact, some of his patents are were approved posthumously, and Maulsby said, "I would assume he still has more patents in the pipeline." This likely would not have been possible if not for America's intellectual property system. "It really is a strong, visual representation of how important intellectual property is for entrepreneurship in this industry," Maulsby said. "Hopefully [the exhibit will bring] a little better understanding and appreciation for the patent system." Maybe. But one thing's for sure: if you're in D.C. before July 8 when the exhibit closes, this is well worth checking out, if for no other reason than to just stand back and see the genius of Steve Jobs facing you as one mass amalgamation of innovation, including a gadget or two you probably own. Also, on June 6, the author of Jobs' best-selling biography Walter Isaccson will be interviewed by Smithsonian Secretary Wayne Clough at the museum.